Randomized controlled trials in CKD lag in number behind those of other chronic diseases, despite the high morbidity and mortality experienced by patients with kidney disease and the exorbitant costs of their health care. Observational studies of CKD frequently yield seemingly paradoxic associations of traditional risk factors with outcomes, making it difficult to extrapolate the results of trials conducted in people with normal kidney function to patients with CKD. However, many completed trials in CKD have been limited by intermediate outcomes of unclear clinical significance or narrow eligibility criteria that limit external validity, and implementation of proven therapies remains a challenge. It is therefore imperative that the nephrology community capitalize on recent interest in novel approaches to trial design, such as pragmatic clinical trials. These trials are meant to promote research within real world settings to yield clinically relevant results with greater applicability than those of traditional trials, while maintaining many advantages, such as controlling for potential sources of bias. We provide a description of pragmatic clinical trials and a discussion of advantages, disadvantages, and practical challenges inherent to this study design, in the context of specific scientific questions relevant to patients with CKD. In the second half of the past century, significant progress has been made in understanding principles of causal inference and in statistical techniques underlying the proper planning and analysis of interventional trials.1 As a result, the randomized controlled trial (RCT) has become the gold standard tool for proving the efficacy and safety of therapeutic interventions.2,3 After their ubiquitous acceptance as the sine qua non of causal assessment, RCTs evolved from small single-center studies to large, multicenter trials. With this shift, the cost of conducting RCTs increased dramatically, common disease states amenable to drug intervention (such as hypercholesterolemia and hypertension) became a dominant focus of inquiry,4 and commercial entities took on enlarging roles in trial design and conduct.5,6 At the same time, gaps emerged between demonstration of treatment efficacy and implementation of proven therapies in clinical care, and high-quality RCT evidence has remained scarce for many important and practical clinical questions. Upon this general background, conducting investigations in CKD has faced additional challenges. The number of RCTs conducted in patients with CKD or ESRD is one of the smallest compared with other medical subspecialties,7 in spite of the rising prevalence of CKD, the enormously high morbidity and mortality experienced by patients with kidney disease, and the high costs of CKD and ESRD care.8,9 Published nephrology RCTs have often examined intermediate outcomes that are of unclear significance to patients, providers, and families, with important exceptions. The complex and heterogeneous nature of CKD has often led to restrictive enrollment criteria that limit external validity.7 Insufficient implementation of the few proven therapies has contributed to increased risk of CKD and its complications in economically and socially disadvantaged populations.10,11 Moreover, observational studies of people with CKD and ESRD have frequently observed seemingly paradoxic associations of traditional risk factors with clinical outcomes,12 making it difficult to extrapolate the results of RCTs conducted in patients with normal kidney function to patients with CKD. It is therefore imperative that the nephrology community capitalize on the recent wave of interest in novel approaches to clinical trial design, such as pragmatic clinical trials (PCTs). This review article will provide a description of the concept of PCTs, a discussion of the advantages, disadvantages, and practical challenges of PCTs, and examples of PCTs conducted among patients with CKD. In reality, any single trial is neither fully pragmatic nor fully explanatory.15 The PRagmatic Explanatory Continuum Indicator Summary-2 tool identifies nine domains to quantitate the extent to which a clinical trial is pragmatic.20 The most pragmatic trials apply broad eligibility criteria, recruit from clinical settings, conduct procedures in the context of usual care using available clinical infrastructure, apply interventions with flexible protocols using usual encouragement, assess outcomes relevant to patients using readily obtainable metrics, and apply intention-to-treat analysis (Figure 1). Rarely is a clinical trial pragmatic in all aspects of its design. Often, some design elements are made less pragmatic in order to maintain internal validity or to accommodate practical needs for implementation. Ultimately, the choice of design for any clinical trial depends on the underlying scientific question and the context in which it is addressed. 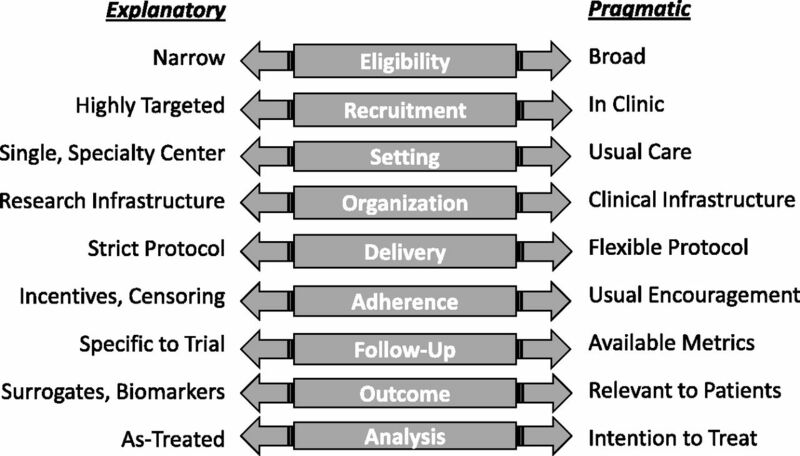 Domains of the explanatory-pragmatic clinical trial design spectrum. Interest in PCTs has grown quickly over the last decade,15 and the nephrology community has been an early leader in this surge, as demonstrated by the examples below. PCTs that involve populations with kidney disease have been facilitated and encouraged through specific funding mechanisms from sponsors critical to nephrology research, including the National Institutes of Health, Department of Veterans Affairs, and the Patient Centered Outcomes Research Institute. Of note, interest in PCTs has grown along with interest in another movement that may appear conflicting – the Precision Medicine Initiative.22 Indeed, whereas PCTs focus on applicability to populations, precision medicine focuses on applicability to individuals. However, there is no reason that trials advancing precision medicine cannot incorporate pragmatic design elements, and PCTs can inform precision medicine by building in personalized components (e.g., intervention flexibility) or the evaluation of between-participant heterogeneity in response. There are several potential benefits to PCTs in CKD (Table 1). First, PCTs may include a broad range of patients with CKD, enhancing external validity. Patients with CKD have diverse underlying and comorbid conditions and often have complicated medical regimens that may be more acceptable for PCTs than traditional RCTs with strict eligibility criteria. In addition, PCTs may include participants from socially disadvantaged populations that bear a disproportionate burden of disease and experience large translational gaps between research and practice,10,11,23 who may be excluded from efficacy trials owing to a lack of reliable transportation or limited English language proficiency or may choose not to enroll in efficacy studies because of mistrust in the research process.24,25 Socially disadvantaged patients may be more willing to participate in the context of their usual site of health care26; recruiting and enrollment data from early PCTs will help address this possibility. Fourth, pragmatic trials for CKD may be less costly than efficacy trials. This is particularly important when considering the length of follow-up necessary to observe some clinical outcomes of CKD, such as progression to ESRD. What is the optimal screening frequency in populations at high-risk of developing CKD? How effective are lifestyle programs for preventing deteriorating kidney function in early CKD? What is the effectiveness of strategies to improve provider awareness and adherence to guidelines on improving outcomes for patients with CKD? What is the effectiveness of patient-safety interventions in reducing complications among CKD patients? What is the effectiveness of computer decision support for CKD management in reducing complications? What strategies will improve family consent for deceased donor kidney donation, taking different cultural groups into account? Institutional review boards (IRBs) serve to protect the safety of study subjects, and each has different rules and regulations to account for local conditions of risk. Multicenter PCTs require harmonization of these local regulations to ensure participant safety and data integrity. This process may be facilitated through use of central IRBs with shared review,41 but confusion regarding divisions of responsibility for collaborating central and local IRBs remains a barrier for widespread adoption.18 Moreover, the concepts and design elements of PCTs are new to many IRBs and data and safety monitoring boards, who may expect, request, or even demand traditional clinical trial design elements that reduce pragmatic elements of PCTs. Contributing to this tension, it may be difficult to define appropriate standards of care for patients with CKD because many guidelines may not offer clear consensus or be based on limited evidence.42 PCTs seeking to challenge traditional care practices may have difficulty defining an appropriate control group or gaining IRB or data and safety monitoring board approval for a design that involves more flexible protocols or less extensive research-specific monitoring than traditional explanatory trials. As with traditional RCTs, sufficient separation in treatment between comparison groups is needed to detect differences in clinical outcomes.43 For PCTs, large separations between groups may be difficult to achieve in a clinical setting with large commonalities in practice, particularly if study participants have little contact with dedicated research staff. PCTs may also increase burden to practicing providers, requiring effective strategies to increase provider engagement and participation without compromising the integrity and “pragmatism” of the study. In addition, PCTs in nephrology are likely to require partnerships with large, integrated health systems, and it may be difficult to harmonize protocols while maintaining local care priorities when there are substantial differences in workflow, EHR, personnel, and clinic culture. Nephrology experience with PCTs is nascent, so many implementation barriers will be new to investigative teams. Novel therapeutic approaches are sorely needed to reduce the incidence and progression of CKD and its complications. The initial evaluation of new drugs is often best accomplished using more traditional RCTs that feature explanatory design elements. For example, extensive eligibility criteria may be used to limit participation to a subset of patients more likely to benefit and less likely to experience adverse events than the broader target population, and extra efforts may be used to enhance adherence and maintain separation of treatment groups. PCTs may be more suitable for subsequent studies in broader populations, for drugs that have known efficacy and are relatively safe, and for studies that evaluate implementation of existing therapies or health care delivery. The effectiveness of screening for CKD is currently being evaluated in a high risk primary care population of United States veterans (Table 2). Using cluster-randomization by primary care team, this pilot PCT aims to evaluate two strategies to improve BP control among nondiabetic hypertensive veterans with unrecognized CKD in primary care (NCT02059408). In the usual care arm, no systematic screening for CKD is recommended. The first intervention evaluates the efficacy of a screen-and-educate strategy that utilizes a “triple-marker” CKD screening approach (creatinine, cystatin C, and albuminuria44) coupled with provider education, compared with usual care. This strategy takes advantage of the VA EHR to identify eligible persons, order screening tests, and deliver recommendations to primary care providers. The second intervention evaluates whether a screen, educate, and intensify treatment program coled by a primary care provider and a clinical pharmacist can improve BP management among persons with CKD, compared with the screen-and-educate provider strategy and with usual care. The primary outcome of the study is change in BP and secondary outcomes include processes of care and clinician burden. This pragmatic study design can be easily translated to any primary care practice with an EHR that utilizes the chronic care model. The Kidney Awareness Registry and Education (KARE) study (NCT01530958) is a two by two factorial trial that assesses the effectiveness of a multilevel intervention to improve BP control among low-income patients with CKD (Table 2). The study design relies on two levels of randomization: primary care practice teams are randomized to one of two arms (access to an electronic CKD registry or usual care); patients of each practice team are subsequently randomized to participate in a CKD self-management program or usual care. With four study arms, KARE allows assessment of the individual and additive effect of both interventions. Although the KARE study design is complex, its pragmatic elements include: setting and participants, intervention components (electronic CKD registry embedded in the EHR and a patient self-management support program that relies on language-concordant health coaches), outcome ascertainment (change in systolic BP and proportion of patients with BP control), and relevance to practice. By relying on existing infrastructure and recruiting actively empaneled patient participants, KARE results will be directly applicable to populations that receive CKD care in similar health systems. Improving Chronic Disease Management with Pieces (ICD-Pieces) is a large PCT spanning several large health care systems that will compare EHR-based clinical-decision support to primary care providers and practice facilitators with usual care among patients with coexistent CKD, diabetes, and hypertension (Table 2).45 The study uses a novel technology platform, Pieces, which has been successfully used in other chronic conditions, such as heart failure, to reduce hospital readmissions and improve clinical outcomes,46,47 in a cluster-randomized design. Study outcomes include hospitalizations, readmissions, cardiovascular events, ER visits, and death. Other pragmatic characteristics of ICD-Pieces are broad inclusion criteria, flexibility of protocols, implementation of the interventions within the context of available clinical infrastructures, robust clinical support tools, electronic ascertainment of outcomes, and intention-to-treat analysis based on assigned cluster. The goal of this PCT is to evaluate a promising new model for the care of CKD patients with multimorbidity. Evaluating Calcitriol Heart Outcomes in CKD (ECHO-CKD) is a PCT, currently in a pilot stage, designed to test the cardiovascular effects of calcitriol, a drug commonly used in CKD for which long-term clinical risks and benefits remain uncertain (Table 2).48,49 The overall goal of the ECHO-CKD trial is to determine whether calcitriol plus usual care, compared with usual care alone, reduces the risk of clinical cardiovascular events among patients with stage 3–4 CKD. Although this question could be addressed using a more traditional explanatory trial, a pragmatic approach facilitates application of results and reduces cost. Pragmatic features of the planned study include integration into a large comprehensive health care system, utilization of electronic resources to identify participants, the application of minimal eligibility criteria, delivery and monitoring of the study intervention using clinical pharmacy and laboratory services, and the ascertainment of clinical outcomes of importance to patients and providers. PCTs offer a valuable approach to increase the evidence base for the treatment of patients with CKD with high external validity and applicability and low costs. However, informed consent, regulatory issues, outcome ascertainment, and other implementation barriers provide challenges to designing and implementing PCTs. If barriers to PCTs can be surmounted and benefits realized, then further training, infrastructure, and funding will be needed to facilitate additional studies. Few investigators in nephrology have substantial experience in PCTs, and training will be necessary to advance and implement high-quality PCT methods. Because PCTs are critically dependent on the health care setting in which they are based, investment in EHRs and partnerships of researchers with health care systems will be required to expand bandwidth. For example, within the Veterans Health Administration, a national coordinating center has been developed to help design and launch PCTs. Currently, the Patient-Centered Outcomes Research Institute and several institutes within the National Institutes of Health have offered funding mechanisms specific to PCTs; additional funding mechanisms appropriate for this study design will be required. Ongoing studies, including those described above, will provide valuable information on the feasibility, strengths, limitations, and hurdles of PCTs in CKD, as well as additional next steps required to move forward this promising approach to clinical trials. I.D.B. has received consultancy fees from Amgen, Bayer (Whippany, NJ), Boehringer-Ingelheim (Ridgefield, CT), and Janssen (Titusville, NJ). S.N. has served on the event adjudication committee of clinical trials sponsored by AbbVie (North Chicago, IL), Bayer, and Boehringer-Ingelheim. The San Francisco VA Medical Center and University of California San Francisco CKD screening study is supported by grant R34DK102152 from the National Institute for Diabetes and Digestive and Kidney Diseases (NIDDK). KARE is supported by grants R34DK093992 and R01DK104130 from the NIDDK. ICD-Pieces is supported by grant UH3DK104655 from the NIDDK. The ECHO-CKD study is supported by UH2HL125122 from the National Heart, Lung, and Blood Institute.